On October 13, 2007, I asked Gina to marry me; she said yes and we announced it to the family that evening during a surprise birthday party for her! This was both our second marriage and our kids were now grown, had their own families and were doing their own thing. It was perfect timing — this was now about us, kids are raised and we’re on our own to do what we want. During a routine physical in January 2008, three months after Gina and I got engaged, I found out that I had multiple myeloma. You can only imagine receiving that call. I had no idea what multiple myeloma was, so when my doctor started explaining that multiple myeloma was a cancer in my bone marrow, I started to get really nervous. Then he proceeded to tell me that it’s a 3-5 year survival rate. I was in total shock and made the call to Gina. We both started crying and I told her that now was a good time to run, since we weren’t getting married for two years anyway. She said no way, now is the time to fight! We went to work on finding out who the top doctors in multiple myeloma were and came up with three of them. We made appointments with all of them and quickly learned what multiple myeloma was all about. We were told about the Multiple Myeloma Research Foundation (MMRF) and the story of Kathy Giusti, which was a big relief that gave us hope that we can fight this terrible disease. What happened next was amazing to me — all three doctors starting collaborating together with my local oncologist just 10 minutes from my home. We all agreed on the best treatment for me and I got started within days. Within a few months my numbers were at zero and I was already in remission. This was eight years ago and since them I have relapsed four times but the same three doctors still see me and still collaborate with my local oncologist. Thanks to MMRF and my doctors being involved with the MMRF, I am always aware of the latest drugs and trials out there as well as what is on the horizon. This is why my wife and I and our families try to support MMRF as much as possible. We have all ran together in half marathons to raise money for the MMRF which has been very successful and great fun as a group. Now we are taking on the Grand Canyon hike to continue our support to the MMRF. This will be very exciting for Gina and me. 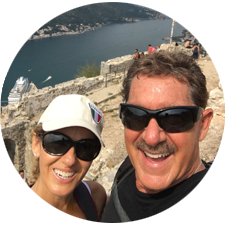 We’re both looking forward to this amazing adventure, not just for the hike, but to meet new people that share the same goals and pressures of living with multiple myeloma. In addition, we know that accomplishing a hike, a run or whatever it may be to support the MMRF and their quest to find new drugs and possibilities of a cure is what it’s all about. Today, thanks to the MMRF and my team of doctors, I am in remission again and feel so confident that they will keep me there for years to come and hopefully come up with a cure for multiple myeloma in the near future.